Interested in Joining Our Camp Family? Please complete and return our Counselor Application. At Camp Jeanne d’Arc, being on staff means more than just a summer job, you join the CJDA family! You will be given a unique opportunity to work with incredible people from the U.S. and around the world in a magnificent setting, the Adirondack Mountains. More than 30 counselors and staff members assist the directors in the day-to-day operations of camp. The camper-staff ratio averages 3:1. As a staff member, you will be entrusted with someone’s most priceless possession, their child. We look for counselors who exhibit the maturity necessary to succeed in this critical role. Our mission at Camp Jeanne d’ Arc is to build strong girls, and empower them with the skills and confidence they need to succeed. What is expected of me as an employee of CJDA? What is the role of a camp counselor? Being a camp counselor will be the most challenging AND most rewarding job you will ever have. What is the role of a jr. counselor? Jr. counselors are not permitted to provide sole supervision of campers. Jr. counselors must attend pre-camp training, commit to attending camp for at least 4 weeks, and had to have served as a CIT for at least one summer. Jr. counselor is a paid position. Click here for more information regarding the Jr. Counselor 2019 position. What is the role of a Senior Staff Member? Senior Staff members support the camp directors in accomplishing the camp mission. Most senior staff members have been at Jeanne d’Arc for a number of years. Does Camp Jeanne d’Arc provide internships? We would love to accommodate your desire to carry out an internship at Camp Jeanne d’Arc. Give us a call and we’ll work out the details. All employees are compensated based on prior experience, qualifications, and level of education; as well as position and availability dates. Camp Jeanne d’Arc salaries are competitive and include room, board, and laundry. Internet access is available to be used during a free period or days off only. Cell phone coverage is limited. Will I have any time off during the summer? Yes. During total employment period, staff members will receive 24 hours or more each two (2) weeks in blocks of no less than 12 consecutive hours. There are no days off during the first and last weeks of camp. Certain exceptions are made for important family events, school events or religious worship, within reason. Will I have access to the internet to use on my time off? Yes. It’s not always totally reliable but we do have access to the internet to be used during free periods or days off only. Currently only phones with Verizon receive cell service. What are your policies on alcohol consumption during the summer? Alcohol, smoking, chewing tobacco and controlled substances are not allowed on camp property. In addition, employees are not to return to camp property under the influence of alcohol or controlled substances. Breaking this policy are grounds for immediate dismissal. I thought my job as a counselor would be to build relationships through deep conversations and a listening ear. While this isn’t wrong, the building blocks to get here are much smaller moments. It’s waiting for the girl that took an extra minute rolling out of bed in the morning, sharing easy laughs over lunch in the Hearth or taking the time to say goodnight to each girl and shut off the lights at the end of an exhausting day. These moments capture the loving and family-like feeling that a summer at Camp Jeanne d’arc inevitably provides. 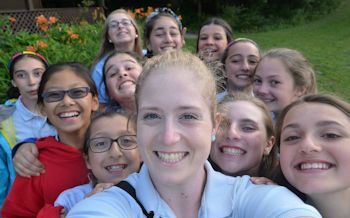 While singing campfire songs, diving into the lake or playing games on the field make JDA so lively and exciting, it is the girls building relationships, sharing stories and discovering new things about themselves that make their experience -and mine- so indescribably unique.